A common misconception about marketing is about its very purpose. Many believe the sole purpose of marketing is to promote ones business. It’s true that any marketing strategy involves promoting the business, but it should be limited. The focus of your marketing strategy should be engaging your audience by educating them on your business and industry. We call this being a broker of information. The focus of your marketing strategy should be engaging your audience by educating them on your business and industry. You’re a business owner. You know everything to know about your business and your industry (and then some!). But there’s something else you need to become to help your business grow–an information broker. Become a leader in your industry and market – as you settle into your role as an information broker, potential customers and even competitors will look your way to educate themselves. Why? Because you have taken the time to build a reputation as a business owner who is knowledgeable and trustworthy. Establish a marketing personality and persona – the more content you publish and the more you engage with your audience, the more confident your messaging will be. This confidence helps you establish a personality that is unique to your business. You’ll become a familiar friend customers and potential customers will want to return to and engage with again and again. Improve what you do and how you do it – this is a byproduct of educating yourself and your staff. As your knowledge of your business and industry increases, so will your ability to stay on the cutting edge of your industry while providing top-of-the-line customer service. Being a broker of information takes time, but it is well worth the effort. The time and energy you put into it will benefit both your business and target audience. 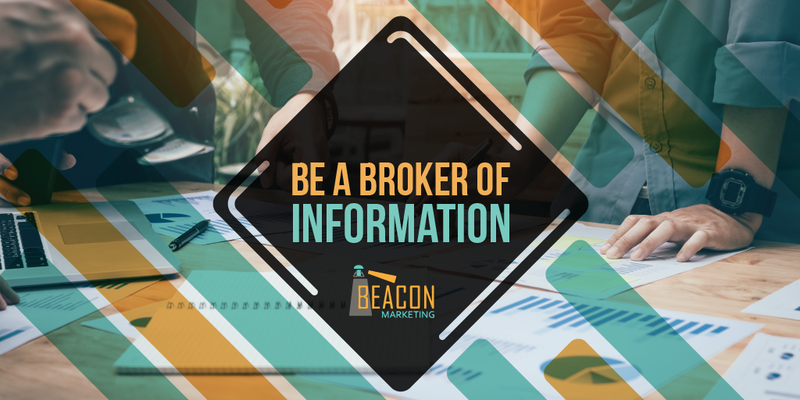 Ready to be a broker of information? We can help! Schedule a FREE consultation today. Create and publish content – Educating your audience about your business is important, and the most effective way to do this is by creating and publishing content. It doesn’t even matter what format it takes or what your unique value proposition (UVP) is–your content should provide information on your industry, your business, and what you do. Engage your audience – as you publish content, make sure to ask your audience to engage with you. This could be by asking for comments on blogs or videos, providing polls or questions in social media, or by sharing customer stories and reviews. And when your audience responds, make sure to reply in a timely fashion. If not, you may earn a reputation for poor customer service. Educate yourself and your staff – if you want to come from a place of authority, you must have the background knowledge. Read articles or books, watch videos, and listen to podcasts pertaining to your industry to further your education. Pass applicable knowledge to your employees so they are better equipped to answer questions which may arise. Your audience is looking for information. If you don’t take this opportunity to provide that information, you can be sure that someone else will.